Thomas has just transferred to a new high school. His parents vanished and he is living with his grandfather. He gets in a fight at school and is sent to ‘Killjoy’ Khanna, the feared vice-principal of his new school. She is not as fearsome as rumour has it, but Thomas doesn’t want to cross her. While looking through the want ads with his grandfather, Thomas comes across a strange ad for an assistant librarian. He convinces his grandfather to apply, but somehow ends up with the job himself. It turns out that he is a cypher and key to a battle between good and evil that goes back before the beginning of history. I liked this story, the plot was fun and fast moving and there were lots of very interesting characters. Unfortunately the cast of supporting characters were so well developed that Thomas gets a little lost in the shuffle. At the end of the book I still don’t have a very good idea of what he’s like. Aside from Thomas being a little flat compared to his compatriots this is a solid read. It is the first in a series and I expect that Thomas will get rounded out as the series continues. I would recommend this book for any young reader who likes adventure. 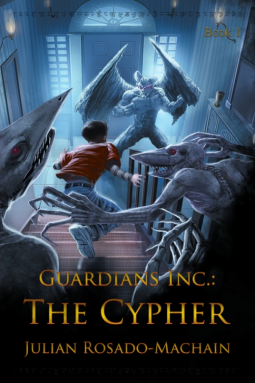 This entry was posted in Children's, Fantasy/Sci Fi and tagged Cypher, fantasy, Guardians Inc, Julian Rosado-Machain. Bookmark the permalink.